According to the Kubler-Ross model of grief, humans go through five emotions when faced with a loss. They go through denial, anger, bargaining, depression and acceptance. As an avid Cleveland sports fan, I am stuck in the anger stage when it comes to the mentally deficient and morally depraved LeBron James - a self-made villain. I don't mean to swear, but LeBron, go **** yourself! I have witnessed some stupidity in my lifetime and a lot of Cleveland sports grief, but the manner in which LeBron pulled his exit to Miami shows how evil and stupid he is. If you are going to have an hour special announcing your exit, you had better have a better message than "winning is everything" or "f you, Cleveland." 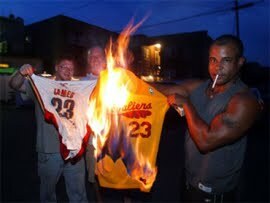 My fellow sports fans in Cleveland agree. People who understand that "winning is everything" is not the biggest message in life also get it. LeBron does not. He needs to move out of the Cleveland area. He is not wanted there, and he is not good enough for us. Character is more important than hoops. P.S. - The Snooze Button Generation is on vacation and likely will take a bunch of days off from posting. But the Generation felt necessary to vent a bit after hearing this horrible news about James.